With all the other choices presented to you for a home remodel, flooring can sometimes take a back seat. However, the choice of material at your feet can have a dramatic impact on a room and the success of other improvements you make. There are several choices for flooring materials available on the market, some tried-and-true and others a bit edgy and new. Whatever you’re aiming for in your project, here are the basics on 6 common hard-surface flooring materials. Red oak solid wood flooring. "Sonora" from Mansion Hill Flooring. 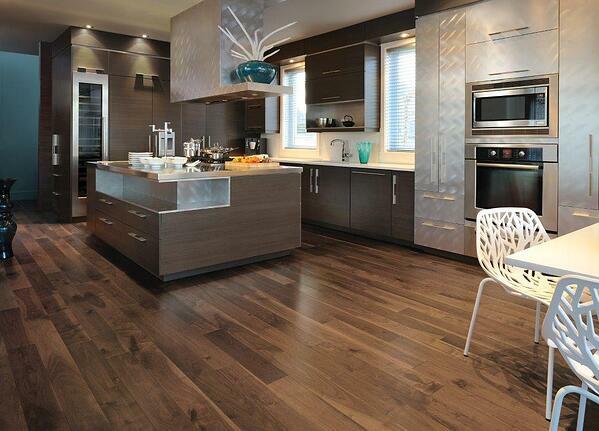 Hardwood floors are a timeless feature in any home. The most popular choices are maple and oak, but almost any hardwood can be used for flooring, including some exotic species. Solid hardwood floors can be refinished as often as needed to repair damages or change the color by sanding away the topmost layer to expose the natural wood in a new smooth layer. Solid hardwood is susceptible to warping and cracking due to temperature and moisture fluctuations, so be sure to research what woods are appropriate for your typical climate. Solid wood flooring comes in planks that can be nailed or glued down, or clicked together and allowed to “float” over the subfloor. Knotty Walnut engineered wood flooring. 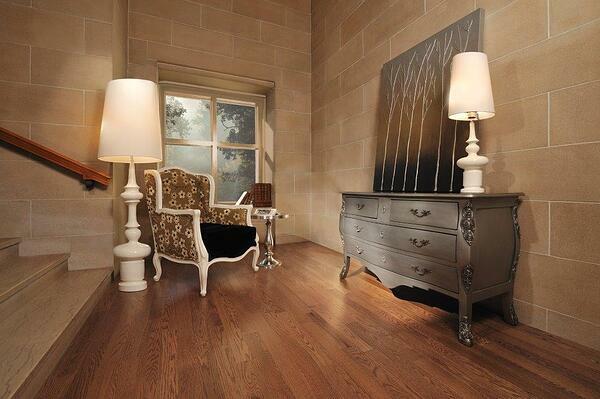 "Savanna" from Mansion Hill Flooring. Engineered wood flooring uses layers of hardwood, plywood or high-density fiberboard (HDF) to create a stable and sturdy plank that is topped with a layer of real wood. This provides a floor with the same visual qualities of solid wood, but increases the floor’s long-term durability, and improves solid wood’s natural reaction to moisture and heat by limiting the floors ability to warp and crack. Engineered wood flooring is installed the same way as solid wood, but most engineered wood manufacturers have developed easy-installing click and lock systems that install quickly. Since the planks have been created to resist changes due to heat, engineered flooring can be installed over radiant heating systems. Engineered floors can be refinished 1-2 times before the top layer of wood is too thin for further refinishing. However, since the product is typically finished at the factory, the top protective coating it usually quite durable and scratch resistant. Laminate flooring is made up of a photographic veneer, simulating the look of wood (and sometimes stone), applied to layers of synthetic resin and fiber board, and coated with a layer of protective clear coat. A low-cost flooring material, laminate planks fit together with a tongue and groove join on each edge without the need for glue or nails, making it a great DIY option. Laminate works well in low-traffic areas, since dirt can scratch away the protective coat, and damage the veneer. Laminate should also not be used in areas prone to water spills, since the fiber content of the planks can swell and warp if it becomes saturated. Laminate comes in a range of styles, with glossy or matte finishes, making it a good choice if you’re looking for something specific or when the real material is too costly for your budget. Porcelain tile in a master bathroom remodel by Neal's. Ceramic tile is a durable material that is ideal for rooms with moisture or heat conditions that even wood flooring might not stand up to, such as bathrooms, laundry and mud rooms, and entry hallways. Since the ceramic can be process, fired and glazed in a wide variety of ways, the options in tile are nearly limitless, including making the tile look like other materials, like natural stone or wood. Similar to laminate flooring, ceramic tile is a cost-effective option. Porcelain tiles, which is distinguished by having a naturally occurring material called feldspar within the clay, is more costly, but the benefits come as higher durability, better color qualities, and greater moisture control. Tiles are installed by securing them to the floor using a cement-like material called mortar or a specialized tile adhesive that can be dispensed from a tube. Tiles are arranged and spaced evenly according to the design, then grout is applied over the surface to fill in those spaces. The type and color of grout paired with the tiles will also affect the look of the floor. It’s important to keep in mind the absorbency and slip resistance of the tile you choose, especially when you’ll be using it in a kitchen or bathroom. 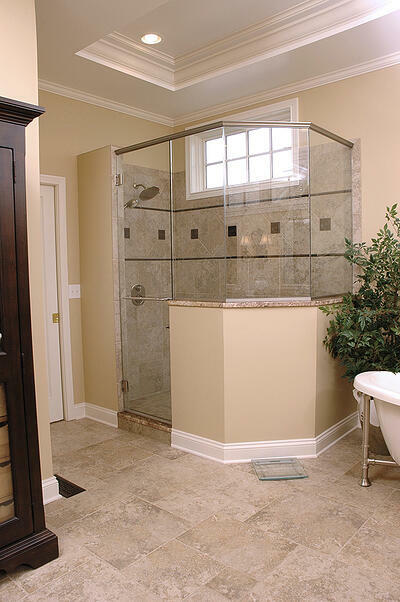 Look for glazing or finishing that adds a slip-resistant coating. Also be aware that dropping hard, heavy objects on a ceramic tile floor may create cracks or chips. 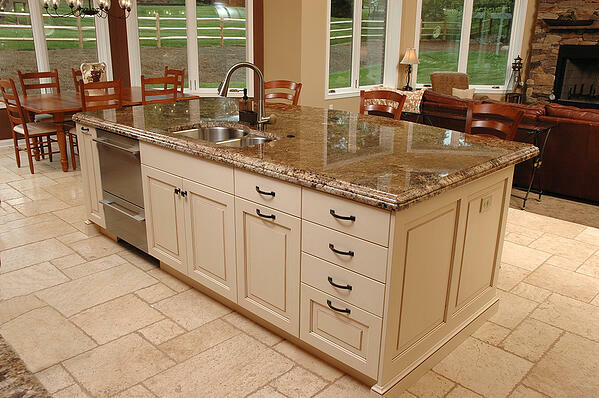 Tumbled natural stone tiles in a kitchen remodel by Neal's. While ceramic and porcelain tiles can provide the look of many natural stones, it’s true that you can’t beat the real thing. There are several stone varieties, each with their own pros and cons. Slate, limestone, marble, granite, flagstone, travertine, and sandstone are the most common options. Each of these have unique finishing and maintenance needs to make them appropriate for flooring, and will handle wear and damage in different ways. Marble, for example, can stain easily and is susceptible to scratching, while travertine will resist polishing. Natural stone can be installed as tiles (18” square is an average), or can be used with more organic, irregular shapes. The type of stone will dictate some of that. Slate is easily formed into straight edged pieces because of its natural flaking qualities, where fieldstone is often created by simply slicing up boulders. Natural stone floors are installed similarly to tile flooring, but be aware that the dust produced in natural stone installation is significantly higher. Renewable, biodegradable and hypoallergenic, linoleum is making a come-back in green-minded remodeling. Available in a variety of colors, linoleum is created by combining linseed oil, ground cork, wood powder, resins and pigment. Linoleum is softer and more flexible than most other flooring materials, making it great for rooms you’re likely to stand in a lot (like the kitchen), or for kids’ rooms as an alternative to carpeting. The material can be cut in tiles or in shapes, allowing for more distinctive and creative options. It is installed by gluing to the subfloor, and is then sealed. Linoleum is water resistant, but not water proof, so again, the amount of water that finds its way to the floor in the room you wish to install linoleum in should be taken into consideration.